Dyno racing... just a number. I find it interesting how I can run 5.40s @ 135-137 all day on a 1472hp fuel only tune and the response is overwhelming, everyone loves it. Get on the dyno, put it on kill mode with nitrous, put up a 2348HP number, and it starts arguments everywhere. At this level, a chassis dyno is NOT the best option for finding peak power, If you have a 1600+hp capable setup, it belongs on the engine dyno if you really want bragging rights. We hope to learn power management at the track this summer and be able to utilize a little more of the power we have on tap, and let the time slip advertise our usable horsepower. 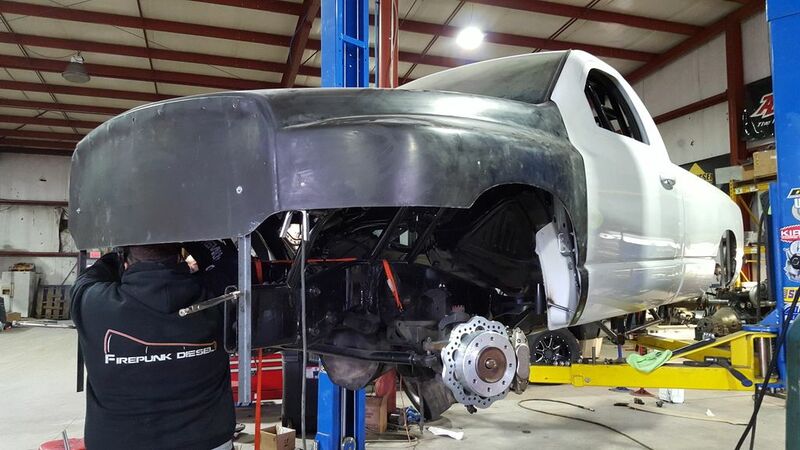 Tuners of quick and fast Duramax pickups. As far as dyno racing goes, look at who does it and then look at what they do or didn't do at the track? Enough said!!! Lets not forget the on street fails. Between crashing and drinking _while_ driving, its rather sad. 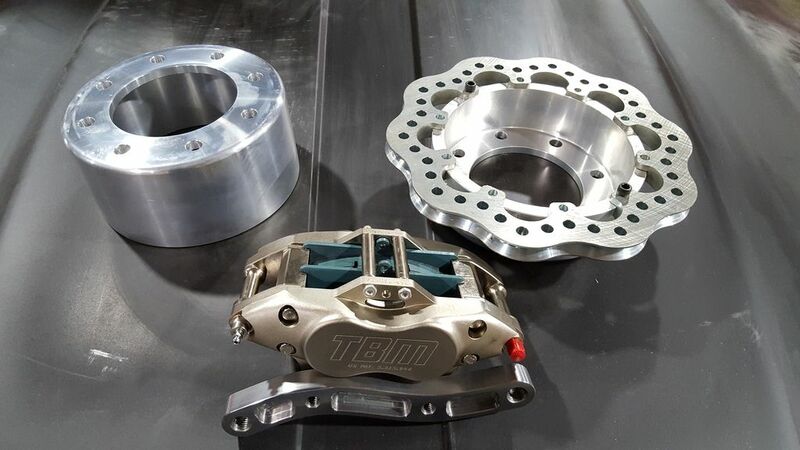 For our brake setup we ran into TBM Brakes at the PRI show and they advertise a Zero drag, instant ON/OFF brake caliper setup if used with a hydro boost setup that has at least 1000psi. They say Pro Stock cars that switch to their brake setup have gone from 198mph to 202mph with only a brake change. 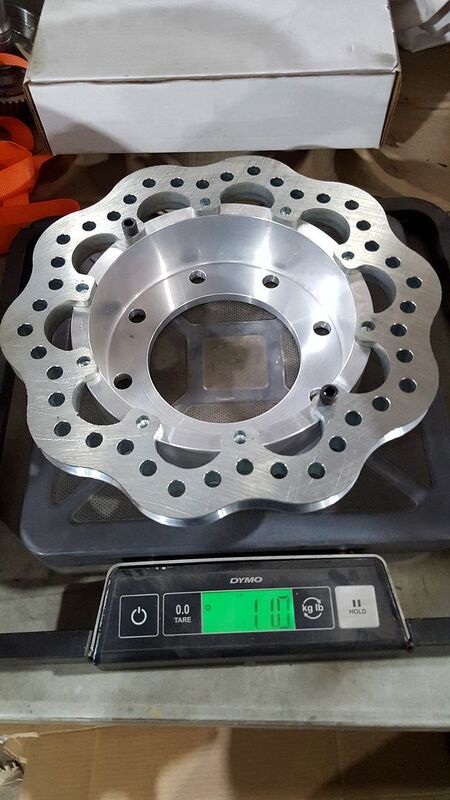 We had Drew @ D&J machine the hats to mount the rotors and also cut the caliper mounting brackets for the front. These brakes have performed beyond our expectations after the first weekend of racing, we are very impressed and would recommend them to anyone. We had to turn down the outside of the front hubs to fit the hat, a lot of work, but in the end worth all the efforts. 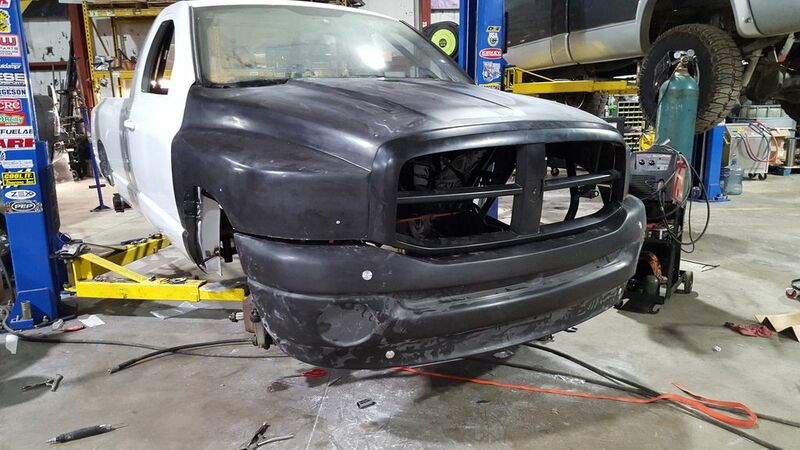 finishing mounting the new front clip and bumper. What size rotor is that? height wise. 13-14"? Nevermind, found the answer to my question. So question on the old triples sizing, i just listened to your new podcast and i was confused when you said your manifold was a 475 with 2 477 as atmospherics. Arent the atmospherics supposed to be the smaller chargers? I realize they are going for more than a street driven truck but i would think the principle would be the same. There is no textbook or commandments on how to build a triple setup. The principle is still the same as running a pair in a compound arrangement. You simply need more air going into the manifold charger so compounding of the air takes effect. This is the only thing that worries me on some of the UCC builds. If they do have enough energy and "need" for triple HX80/2/3 turbochargers then how many blocks will actually survive the weekend? 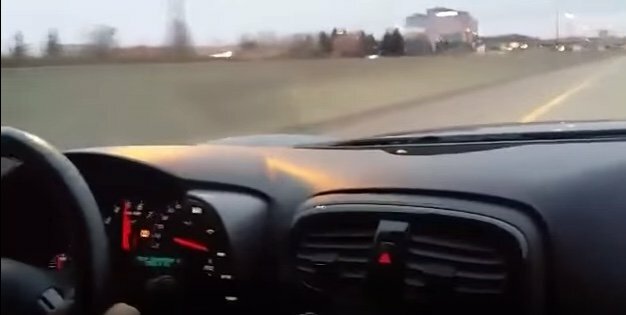 Did you make a solid mount for the transmission too? Or run a stock one or poly mount?